I am using the sp package in R to plot sampled points along a river. However, I would like to zoom in to a sampled area of the entire river, and plot this zoomed area on the full length of the river. 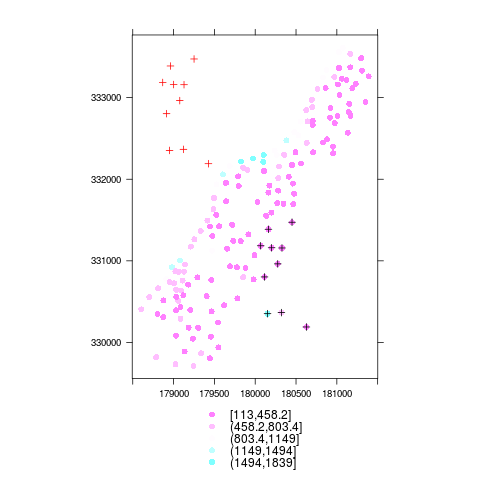 Using the spplot function is useful, as I have various variables per point. To "zoom" in, I can simple change the ylim and xlim arguments when using the spplot function. ZOOM<-spplot(meuse, xlim=c(170000,  181000), ylim=c(329714,333611))   #Random area to zoom in. I am trying to find a way to add the ZOOM to an area on the Full.study map.I suspect because spplot is dependent on lattice it may not be possible. In that case, I would have to create a map for each variable independently, and add the respective zoomed area, probably through par(new=TRUE), but this is just a thought. I would still have to figure out how to specify the location and adjust the size of the of zoomed area. Any suggestions would be welcomed. Thanks in advance. Here is a suggestion using ggplot. I use ggplotGrob to combine the full and zoomed map and grid.arrange from the gridExtra add-on to combine the maps for different variables. There are many adjustments that can be made, of course. 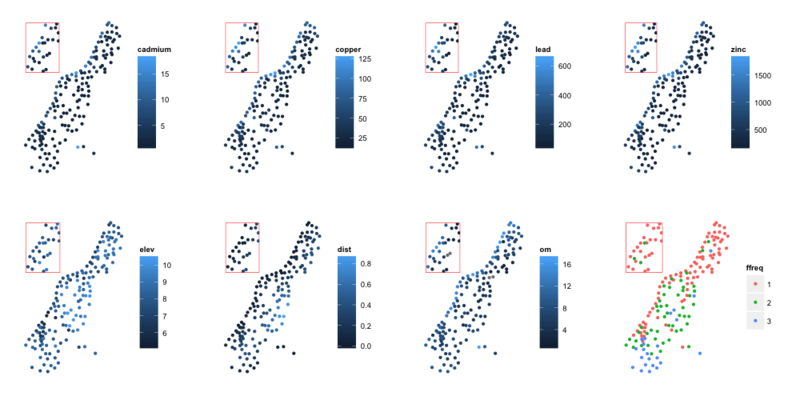 Similarly, ggplot can handle rasters. Not the answer you're looking for? Browse other questions tagged r mapping sp or ask your own question.